Is Sheriff Charles MacNair a Bigot or a Fool or Both? It is difficult to decide whether Sheriff Charles MacNair is just a malevolent old fool or a plain ignoramus. Clearly he is not the intellectual of the Scottish bench (one hopes!). The statement that ‘Saying that a state is terrorist says that everyone within the state is terrorist." should take first prize for judicial stupidity 2011. This is the fascist ideology in a nutshell. People are there to serve the state, . Indeed they identical with the state. Nazi Germany cultivated the Führerprinzip (leader principle) and Hitler was generally known as just der Führer ("the Leader"). One of the Nazis' most-repeated political slogans was Ein Volk, ein Reich, ein Führer — "One People, One Nation, One Leader". Clearly Sheriff MacNair subscribes to the same beliefs that got UKIP MP, Godfrey Bloom, expelled from the European Parliament. A state is literally, in Engel’s well-known description, a ‘body of armed men.’ It is an organisation which, stripped away, is a mechanism of coercion. To confuse a state with those who live in it is to subscribe to the fascist notion that there is complete identity between the nation state and those who live in it. So when George Bush described Iran as a terrorist state, was he saying that all Iranians are terrorists? If that is what Sheriff MacNair believes then he is a racist, abusing his position on the bench and he should be stripped of office. He associates every person living in a state with the actions of that state. No one I know suggests that all Israelis are terrorists or terrorist supporters yet the state itself is clearly a terrorist one. Many of its supporters, including non-citizens like the complainant Reitblat, clearly are supporters of that terrorism. But that is a conclusion based on his evidence in court, not because he was Jewish. We called Bush a terrorist but that didn't mean all Americans were. Leaving aside the question of evidence and whether Paul Donnachie actually said what is alleged ‘You’re a terrorist’ to his fellow student, Chanan Reitblat, the suggestion that Reitblat was ‘‘member of Israel’ is even more bizarre. There is no ‘Israel’ unless one is referring to one of 12 ancient tribes that allegedly existed a few thousand years ago. If the reference is to the Israeli state then Reitblat isn't a 'member' (presumably citizen) since he is an American citizen. The idea that one’s Jewishness and support for the Israeli state are one and the same thing is not only nonsense but a Zionist nostrum. A politically contested idea. Zionism, a political creed, does hold that all Jews, wherever they belong, are responsible for the actions of Israel. That is why the Zionist movement was historically seen by Jews as the creation of anti-Semitism. Far from having convicted Donnachie, Sheriff MacNair should have convicted himself of racism. Because what he ruled was that a political statement about Israel is a racist offense per se as it strikes at the identity of all Jews. 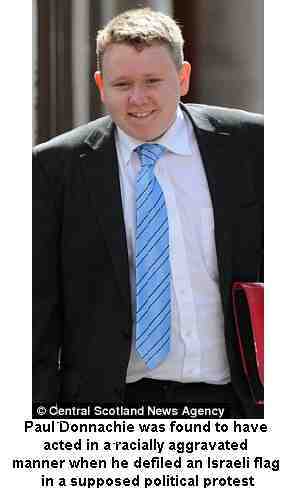 MacNair is entitled to his stupidity, he is not entitled to convict or jail someone because of his own stupidity. MacNair refused to admit expert witnesses because there was nothing they could teach him that common sense could not. A judicial Alf Garnett minus the humour. This demonstrates that his mind was so made up he couldn't even be bothered to go through the routine of listening to evidence. The decision, which is likely to be overturned on appeal, [the Scottish judiciary is known for both its stupidity and supiness, but even they have limits] is of course an open threat to free speech and civil liberties. That is why the decision of St. Andrew’s University to expel Paul Donnachie, within one hour of his conviction, and their decision to suspend his fellow Sam Colchester, is also so scandalous. Do they not have disciplinary procedures at St Andrews? Is this why the monarchy loves them? This is as clear a breach of natural justice as it is possible to find. St. Andrews should have been upholding the rights of their students to express their opinions. That is what universities are supposed to be about, not acting as the academic arm of a local judicial bigot. It is noteworthy that even the Daily Mail, not noted in the past as a supporter of the Palestinians, has come out against this scandalous decision. Cupar Sheriff convicts anti-racist of “racism”; Appeal underway. Sheriff Charles MacNair: "Saying that a state is terrorist says that everyone within the state is terrorist." In what justified shouts of "scandal" from the public gallery, Sheriff Charles MacNair found Paul Donnachie guilty of racially aggravated conduct today. Even the Daily Mailwas shocked. The case centred on testimony from Paul's former friend, Jewish fellow student, Chanan Reitblat. Reitblat told the court that both Paul and his co-accused, Sam, had soiled his Israeli flag, following up with comments that "This flag is a terrorist symbol; Israel is a terrorist state; you are a terrorist". No other witness corroborated this statement by Reitblat. Reitblatt stated in court his firm opposition to international law, his belief that there was no Israeli occupation of any part of Palestine, and his political commitment to Zionist Jews' right to control the entirety of Israel and Palestine, as well as parts of Syria and Egypt. It's worth repeating - No other witness corroborated Reitblat's assertions. When asked by Procurator Fiscal Brian Robertson "do you see yourself as affiliated to Israel? ", Reitblat replied, "Of course. Israel is a Jewish state... You cannot separate Israel from Jewishness... Israel is a state I feel affiliated to by religion." Explaining that although he had never been to Israel, he believed "Israel is a land for Jews... The Jewish people have a right to self-determination. That is part of my religious belief." The prosecution led 8 witnesses, only one of whom, Reitblat's room-mate Matt, provided any information pertinent to the racially aggravated conduct charge. He was the only person present in the room other than Reitblat, Paul and Sam. Matt testified that what happened was boisterous but good natured; nothing that was said or done was malicious, and that nothing was directed or targeted at Reitblat as an individual. This testimony stands directly against Reitblat's assertion that they both said, "you are a terrorist". Matt said that Reitblat was irritated by the incident but said that his level of annoyance seems to have increased over time. Reitblat had told him that he was annoyed that Sam had peed in his sink, and that Paul had soiled his flag. Reitblat denied in court that he had discussed this with Matt. Reitblat also told the warden at the student halls of residence that Sam had done nothing. She said so when interviewed by police, and again in court on Monday. Later, in his summing up later, the solicitor for Paul's co-accussed, Sam Colchester, explained that Reitblat's evidence had been "unreliable and incredible". He went through a range of clear inconsistencies between what Reitblat had said in previous statements and what he now says. This went unchallenged. The sheriff declared a "NOT PROVEN" verdict in relation to Sam. After the prosecution case had been made, Paul's lawyer argued that there was no case to answer; that the evidence led did not constitute a crime. He argued that soiling the Israeli flag, which Paul has openly admitted all along, was not a crime, and that there was no corroboration of Reitblat's accusation that they had said, "you are a terrorist", which was the only accusation pertinent to the racially aggravated conduct charge. The sheriff seemed to ignore these arguments completely, stating that "his conduct had been directed toward the complainer purely because of his membership of a racial group". The sheriff argued that it had been alleged by the complainer, Chanan Reitblat, that Paul had said, "This flag is a terrorist symbol; Israel is a terrorist state; you are a terrorist". He went on, "even if we assume that he didn't call him a terrorist, the other comments were directed at him because he is Jewish and has a link to Israel." So the sheriff decided that there was a case to answer, so the defence case would have to be made. Giving testimony, Paul explained that the defacing of flags was a time-honoured method of showing disaffection to the state, and explained that he had never called Reitbalt a terrorist, but that he had said Israel was a terrorist state. "I'm not contending that my action toward the flag was commendable or dignified, but it was a political expression." The sheriff made a very confused attempt to clarify what Paul meant when he referred to a state, and tried to conflate criticism of a state with criticism of the people within it. Paul made a clear distinction. He told the sheriff that "the citizens of a country cannot be held responsible for the actions of a state". Sheriff MacNair explained that,"The state of Israel is the land and its borders and the people in it", and continued, "Saying that a state is terrorist says that everyone within the state is terrorist." He considered that what Paul did was "done because he [Reitblat] was a Jew and because of his association with Israel." The sheriff then refused to allow Paul's lawyer to call the three expert witnesses to appear. Liz Elkind and Sarah Glynn, both leading members of of Scottish Jews for a Just Peace, and SPSC chair Mick Napier were going discuss the dangers of conflating Judaism with Zionism and Israel, the history of Zionist attempts to do so, and the concepts of Israel and Israeli nationality. The sheriff considered this irrelevant because there was nothing they could teach him that common sense wouldn't provide. In his summing up, Paul's solicitor reminded the sheriff that there had been "no corroboration of the accusation that Paul had called Reitblat a terrorist". The sheriff had already explained to the court that Scots law requires corroboration; one witness is not enough. Paul's lawyer explained that the defacing of the flag was an "act of political expression, as protected by article 10, which included physical acts. He discussed proportionality of the charge: "the Napier [SPSC5] case discussed the stigmatisation attached to the charge". He said that "an affront to the flag, criticising the state of Israel, is not a criminal act in terms of Section 50A." The sheriff responded: "Saying that a state is terrorist says that everyone within the state is terrorist. He doesn't distinguish between the state and the people." The sheriff continued, "Mr Donnachie doesn't distinguish between the government of Israel and the state." The expert witnesses may have been able to teach the sheriff something after all. Pity it was too late. The sheriff then took less than 5 minutes to come to a decision. In relation to Paul, he said that there was "only one issue of fact between them" [the statement, "you are a terrorist"]. "I hold that you said, that's a terrorist flag, Israel is a terrorist state, and you are a terrorist. "Section 50A requires malice or ill will towards a person based on their membership of an ethnic group; which includes nationality and association with that group. "It was malice and ill will because of his presumed membership of Israel." The sheriff found Paul guilty of racially aggravated conduct, and deferred sentence until Sep 13th. It should be highlighted that Paul has been convicted on the uncorroborated evidence of one person. That person is an ultra-zionist, who in court refused to accept that Israel occupies the West Bank. On top of this, grounds for appeal include (but are not restricted to) the sheriff's refusal to receive the devolution minute at the last diet (legal challenge over the competency of the charge); and his refusal to exercise discretion in allowing the defence to call witnesses this afternoon - witnesses who according to Paul's lawyer were clearly "cogent to the determination of the case." 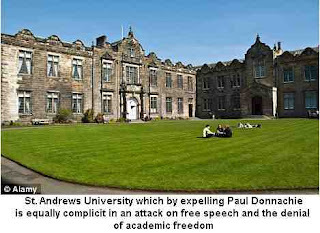 Within the hour, St Andrews university had expelled Paul and suspended Sam for one year. "The judge had earlier refused defence solicitor Patrick Campbell to allow evidence from academic experts on whether the actions of Donnachie constituted an attack on the Israeli state as opposed to racism. "She said: 'As Jews you should be ashamed. This is devastating.'" "Reitblatt stated in court his opposition to international law, his belief that there was no Israeli occupation of any part of Palestine, and his political commitment to Zionist Jews' right to control the entirety of Israel and Palestine, as well as parts of Syria and Egypt...Paul Donnachie, in his moving and principled evidence to the court, explained that his hostility to the Israeli flag was based on his anti-racist convictions, and anger at Israeli terrorism against the Palestinian people. Donnachie explained to Sheriff MacNair in simple language his position that 'the citizens of a country cannot be held responsible for the actions of a state'. When he had finished, Sheriff MacNair gave his own ludicrous opinion that, 'The state of Israel is the land and its borders and the people in it...Saying that a state is terrorist says that everyone within the state is terrorist.'" Student Paul Donnachie was found guilty on Tuesday in Cupar Sheriff Court of ‘racially aggravated conduct’ after showing contempt for an Israeli flag on the wall of a two-bed student residence shared by his friend and an American Zionist ultra. The Sheriff took five minutes after the closing submissions to hand down his guilty verdict and called for a social enquiry report, often a signal to all concerned to expect a harsh, or even a custodial, sentence. Within the hour, Paul Donnachie received a letter of expulsion from St Andrews University. He will appear at Cupar Sheriff Court on Tuesday September 13th for sentencing. 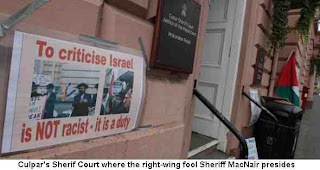 A clear message at Cupar - not racism, but a moral imperativeTo reach his politically-driven verdict, Sheriff Charles MacNair violated every canon of fairness and balance, and ended by making a brief but incomprehensible argument, basing his guilty verdict partly on his characterisation of US citizen Reitblatt as a ‘member of Israel’. Such bizarre formulations in open court were not the only signs that MacNair is unfit to dispense justice; he also overturned his own previous decision, delivered in open court, to hear the evidence of three expert witnesses called by the defence who could shed light on the origins, regularity, and frequent embarrassing failure of politically-motivated accusations of racism in Scotland against supporters of Palestinian rights. They would also have highlighted the dangers for Jews everywhere of the Court accepting Reitblatt’s claim that his religion, ‘Jewishness’ and Israel were inseparable. The outcome was that the defence was unable to call any witnesses other than the accused. Academic witnesses including two leading members of Scottish Jews for a Just Peace and the chair of Scottish Palestine Solidarity Campaign were left in the witness room while Sheriff MacNair exhibited a glaring ignorance of the subjects the witnesses would have illuminated. Reitblatt stated in court his opposition to international law, his belief that there was no Israeli occupation of any part of Palestine, and his political commitment to Zionist Jews' right to control the entirety of Israel and Palestine, as well as parts of Syria and Egypt. Reitblatt also claimed that the insult to the Israeli flag, a gift from his brother while serving in Israel's Occupation Forces, an army notorious for its human rights violations, had made him unable to sleep or eat for some days. Paul Donnachie, in his moving and principled evidence to the court, explained that his hostility to the Israeli flag was based on his anti-racist convictions, and anger at Israeli terrorism against the Palestinian people. Donnachie explained to Sheriff MacNair in simple language his position that "the citizens of a country cannot be held responsible for the actions of a state". When he had finished, Sheriff MacNair gave his own opinion that "The state of Israel is the land and its borders and the people in it...Saying that a state is terrorist says that everyone within the state is terrorist." Sheriff MacNair claimed he "took no position on the rights and wrongs of the Israel-Palestine conflict", but stressed that he "was impressed by Reitblatt’s testimony". MacNair rejected, and seemed not to understand, Donnachie’s clear exposition of the difference between a state and a population. His description of Reitblatt, a Lithuanian-born American citizen who has never visited Israel/Palestine, as a "member of Israel" seemed to be a key part of his case in convicting Donnachie on a charge of racism towards the Lithuanian-born American. MacNair dismissed the relevance of the legal precedent of the ‘SPSC 5’ trial in front of Sheriff Scott in Edinburgh Sheriff Court in 2010 which distinguished between hostility to the State of Israel and racism, on the grounds that the ‘offence’ was racist because it took place in a ‘private space’ rather than in public. The logic of Sheriff MacNair’s ruling would be that criticism of the State of Israel will be inhibited on numerous occasions within earshot of Zionist Jewish supporters of Israeli ethnic cleansing and apartheid on the grounds that they are ‘members of Israel’. We call on supporters of Palestinian rights, anti-racists, and supporters of free speech to assemble outside Cupar Sheriff court on Tuesday September 13th at 9am to support Paul Donnachie. An injury to one is an injury to all. Report of Cupar trial: Cupar Sheriff convicts anti-racist of 'racism'; Appeal underway. A judge has ruled that a St Andrews University student who defiled an Israeli flag in a supposed political protest was acting in a racially aggravated manner. Paul Donnachie, 19, put his hands down his trousers and touched the flag belonging to Jewish exchange student Chanan Reitblat in what he claimed was a 'political statement'. Donnachie's co-accused Samuel Colchester, 20, was found not proven by Sheriff Charles Macnair following a two-day trial at Cupar Sheriff Court. Donnachie, who will lose his place at St Andrews with immediate effect, said he was 'devastated' by the decision. During his evidence, Donnachie had insisted that he had not meant to cause offence and said he found racism 'abhorrent'. And he strongly denied calling Mr Reitblat a terrorist. The judge had earlier refused defence solicitor Patrick Campbell to allow evidence from academic experts on whether the actions of Donnachie constituted an attack on the Israeli state as opposed to racism. In earlier evidence, Mr Reitblat told how he felt he had no option bit to 'get out of St Andrews' following the alleged incident. Under examination from fiscal depute Brian Robertson, he spoke of how he felt 'violated' by the actions of his peers. He added that Facebook comments made by Donnachie in the wake of the disturbance prompted him to flee to Glasgow as they made reference to Palestinian organisations linked to terrorist atrocities. Today's verdict comes after an Edinburgh sheriff ruled criticism of Israel was not racist after members of the Scottish Palestine Solidarity Campaign disrupted a performance of the Jerusalem String Quartet in the capital. Sheriff James Scott threw out charges which suggested the conduct was racially aggravated, saying that a conviction would render human rights legislation worthless. Out is Hajo Meyer, a Jewish anti-Zionist and a survivor of Auschwitz, who refused to speak alongside Gilad Atzmon, who denies that Auschwitz was a death camp. Gone is Sabine Schiffer, an academic expert on racial stereotyping in the Media, in particular that involving Muslims. Gone is Ramzy Baroud. They are replaced by Sameh Habeeb, the angry young man from Gaza who edits the Palestinian Telegraph. Nothing wrong with being angry, of course, at what Israel does and has done to Gaza, but giving comfort to holocaust deniers is probably not the best way of demonstrating that anger. His flirtations with holocaust denial have already ensured that all patrons bar one of his web blog have pulled out (the one remaining being Lauren Booth). Also on the list of invitees is Dr. Samir Abed Rabbo, a Palestinian academic and one Makram Khoury-Machool, a right-wing academic and Head of Mass Media at the University of Hertfordshire who seems to have no staff profile at all, unlike other academics. Gabi Weber, the conference organiser, sent me an angry e-mail 2 days ago, accusing me of forgery, wrong facts and trying to assassinate David Cameron (I made the last one up!). She told me that Hajo Meyer had already pulled out of the conference, but failed to explain why he should do so. Likewise Sabine Schiffer had other ‘professional commitments’ one of which was a refusal to speak alongside a holocaust denier. She denies that Ramzy Baroud has pulled out as he is sending them a video, but the evidence suggests otherwise. The most Weber tells would be participants is that ‘Two speakers pulled out because of work engagements and disagreement concerning the contents of the conference.’ I have posted a comment asking what these disagreements were but I suspect that too will be pulled! Either way this Conference is clearly on the rocks. Atzmon has been forced into sputtering cries of revenge as he has found himself unable to withdraw his comments that Jews ‘freely’ joining the death marches, when the extermination and concentration camps after the war were dismantled, thereby ‘proving’ that there was no holocaust. That is the lie that Atzmon can’t and won’t retract. When Atzmon and Weber talk about the boundaries of open discussion, it doesn’t simply mean opposing the criminalisation of those who remember the Nakba and bringing what happened between 1947 and 1949 into the forefront. It also means accepting the nonsense of Ernst Zundel and a handful of neo-Nazis who pretend that there was no extermination of millions of Jews, who deny that which they would like to repeat. The evidence is so copious, for example neither Eichmann or Hoess ever denied what happened at after the war, that it cannot but discredit the Palestinians. The Nakba happened, the Final Solution happened. Those who deny the former are no different in principle with those who deny the latter. And those who perpetrated the Nakba are no different in principle from those who perpetrated the holocaust But Atzmon and co. would indeed deny the final solution or ‘raise questions’ as if the criminal deeds of the Nazis (& Zionism) aren't established fact. For Atzmon everything is a narrative, nothing is fact. Not the holocaust, nor the Nakba. And of course all you need to do to change the past is to change the story-line, the narrative. As more people wake up to Atzmon in this country, so he seeks pastures anew to spread his vile beliefs. And as the pressure mounts on him, his old trick of giving a nod and a wink to holocaust revisionism gives way to blurting out publicly where he actually stands on such matters. When we picketed Bookmarks 6 years ago, because the SWP held a meeting with him as a speaker, Atzmon was forced to issue a statement denying he was a holocaust denier. Today he doesn’t bother to tell the same lies. And although Atzmon will no doubt protest that ‘the ‘anti-Zionist’ Jews’ are responsible for his humiliation (the inverted commas suggest that to be a Jew means one cannot be an anti-Zionist) the reality is that most people with their feet on the ground know that an association between holocaust denial and the Palestinian cause can only damage the latter. 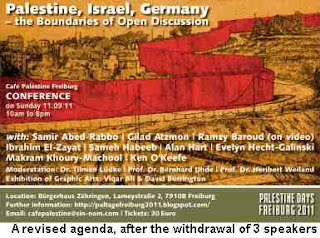 As Gaby Weber has stated no one wants this conference to go ahead more than the Zionists. So far we have had very little trouble from Israeli or Zionist individuals, groups and institutions. In fact those who work diligently at trying to discredit and destroy the conference are a few who, for some reason, identify themselves as "Jewish ‘anti’- Zionists". And is it any wonder? And although we would have refused to participate, it is yet another lie to say that we were invited to do so. This affair has also demonstrated that being an activist is not enough. Ken O’Keefe, who many of us admired for his role on the Mavi Marmara, has shown himself to be politically shallow. Of Evelyn Hecht-Galinksi I know nothing. She appears to be so disgusted by the support of fellow Jews for Israel, with which I concur, that she has lost all sense of proportion. 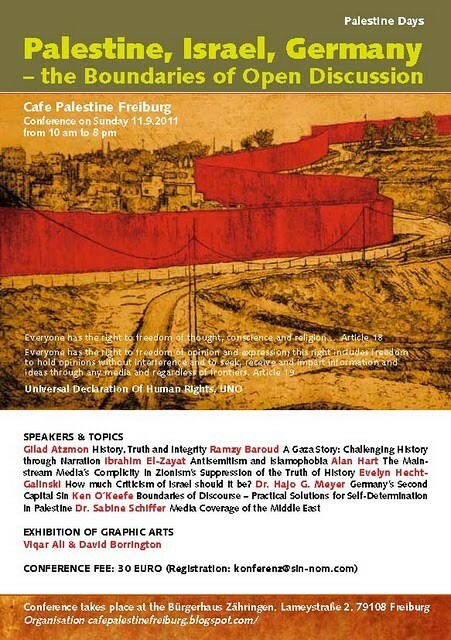 Associating with supporters of holocaust denial is not a way to build support for the Palestinians, in Germany especially! The new wholly Arab/Palestinian replacements for the speakers who pulled out need to think long and hard about what purpose and interest the Conference serves. And whether their role is actually undermining the very cause they support. thank you so much for your endless attempt to convince the speakers of Freiburg Conference not to attend. I think that you should serve your energy for more promising projects. 1. my name is Dr. Gabi WEBER and not Mayer. Obviously some people - at a certain age - don´t know exactly what they do. I must admit that this could be a very good explanation for your sick behaviour. 2. Hajo G. Meyer already pulled out, you are really not up to date, Mr. Greenstein. 3. It is not a "number of speakers" that withdrew. Besides Hajo G. Meyer it is only Sabine Schiffer who had to cancel because of professional duties. Ramzy Baroud didn´t withdraw. He will send his message through video and his speech will be distributed in the conference. So perhaps once in your life you try to tell the truth, Mr. Greenstein! I am very sorry I got your name wrong. No matter, I got the right person. Your English is somewhat deficient if you accuse me of forgery. I'm not trying to copy some valuable document or currency nor am I trying to pass off someone else's article as my own. Despite asserting that I have given wrong quotes, allegations and facts, I notice that you don't give any examples. A mere assertion is worthless. Hajo Meyer, himself a survivor of Auschwitz, clearly wasn't pleased with your invitation to a holocaust denier who effectively was saying that he was a fraud. That was why he informed you in an e-mail of 3rd August, which I've copied below, that he intended to walk out if Atzmon didn't retract the quotation about Auschwitz. I assume that this is one of your 'wrong quotes' you refer to. I also assume that you then withdrew his invitation to speak. I notice that you don't say why Hajo Meyer 'pulled out'. Perhaps you'd like to supply us with the 'right facts'? 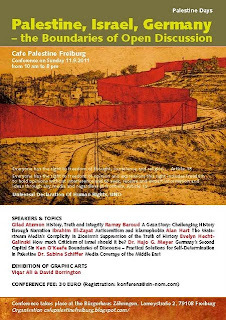 My information is that both Ramzy Baroud and Sabine Schiffer thought better of making an appearance, given the presence of Gilad Atzmon. I am involved in some very promising projects, which is why we cannot afford to let racist projects, such as your own, sully the cause. Or perhaps you hadn't noticed that in Britain and Ireland we have made considerable progress with BDS, especially among the trade unions, despite Atzmon's belief that an academic boycott is 'book burning'. http://peacepalestine.blogspot.com/2007/07/gilad-atzmon-interview-tangling-with.html Of course I understand why, because of the final solution and the Nazi era, Germany has not been as advanced as other western countries. Israel and Zionism have not hesitated to guilt-trip them and make the younger generations feel they were responsible. This is precisely why I do not understand the 'logic' of holding a conference on Palestine with a holocaust denier as its main speaker in Germany of all places. What kind of idiot believes that it is helpful to Palestinians to give a platform to someone who not merely denies the extermination of the Jews in Germany but believes that the Palestinians' plight can be explained by 'Jewishness' not settler-colonialism? Would you have explained Apartheid in South Africa by 'whiteness' or the colonisation and extermination of Amerindians as being inherent in being a White British Expatriate? Did the British behave any different in Ireland, which actually was a model in many ways for Mandate Palestine. Everything you do is a free gift for Zionism, which is probably why Atzmon argues that Zionism too doesn't exist, at least not in Israel. As for your conference. The only purpose it can serve is to boost Atzmon's and your own egos. The fact that David Duke ex-Grand Wizard of the Ku Klux Klan is such an ardent supporter of Atzmon's writings should give you pause for thought, to say nothing of Dukes links with a mutual friend Israel Shamir. If Shin Bet or Mossad had wanted to organise a conference designed to damage the Palestinian cause they could not have achieved half as much as you have done. But as you said, it's not the Zionists who have given you any problems, it's Jewish anti-Zionists. 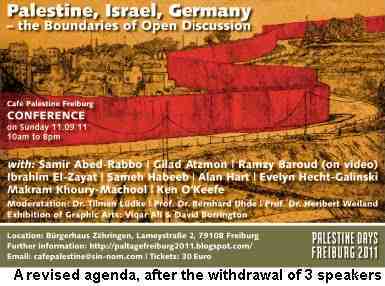 Have you ever wondered why our normally voluble Zionists are hoping that your conference is a 'success'? If this text is indeed from GA’s hand, there is only one way that he and I can be on the same conference together: viz. he distances himself loud and clearly and for 100% from it at the very start of the conference or I leave the conference after having made a public statement why I do that. This is because if he means this text is valid it implies that I, who saw the smoke from the crematoria, saw the gas chambers and smelled the burnt human flesh and was forced to march with the SS to the east, am implied by his text to be a liar who put the number on his arm in order to make himself interesting. Actually I gave you a similar comment on this text quite a while ago. I am very, very sorry that I make life difficult for you but I cannot bear to be in any way associated which such a text by a lunatic. Why does he not deny that the earth is round and that there was ever a First World War. Actually I once published my opinion that holocaust deniers should be put into a lunatic asylum and not into prison. Because they are either full fledged lunatics or they are under influence of drugs and alcohol and need anti addiction treatment. Sorry for making life difficult for you but there are limits to what I can tolerate. Who Really Owns Israeli Capitalism?